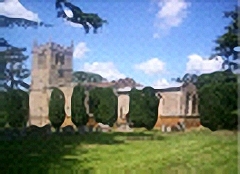 The Bells of All Saints Church Cottesbrooke will be rung on Wednesday the 3rd of April as a "Peal" starting at 3pm. The peal is in memory of The Rev William Gibbs who was a previous Rector of All Saints Church, who died last September. This page of Cottesbrooke News has been brought to you by Chris Utley. Chris stepped down from this role with the previous issue of The Village Link but has gallantly come up with some stories for this edition. It would be really good to continue to hear from Cottesbrooke so if you have a story or a picture that would be of interest to your fellow villagers and neighbours, please get in touch and we can send out our roving reporter! Mr Stefan Croft with the permission of the Estate Farm Manager Henry Clemens, successfully launched a model rocket in an open field in the village. The rocket, purchased from the Northampton Model Shop, entertained the village children and their parents during the recent school holidays. It was a damp foggy morning but success was achieved thanks to the patience of all. The Rocket was launched from a special pad and reached the low hanging clouds, descending by parachute. It was quite a sight! Please be on the alert for 'Unannounced Visitors' to your property. Recently one villager was totally surprised when a young person was seen having a 'look around' and when approached, with his hands on the rear doors of a parked van, said he had lost his horse and was looking for it. A verbal exchange took place and he left. The Legendary Safari Guide by Suzie Casanove. The Hairy Faerie by Joseph and Sparkle D’Lacey. Published by Troubador in 2015.